It all started with the desire to create an unconventional avocado recipe – something that would make us pause and say …wow! In our household we believe that avocados rock! Actually I would even admit that we love avocados – a lot. We eat several of them a week. But coming up with an avocado recipe that is a game changer, that’s a different story. I was after something that was beyond the standard guacamole or avocado toast. Nikki and I put our heads together and her first suggestion was to make “Cooked Avocado”. Sounds interesting, but personally I enjoy the flavour and texture of raw avocado more. 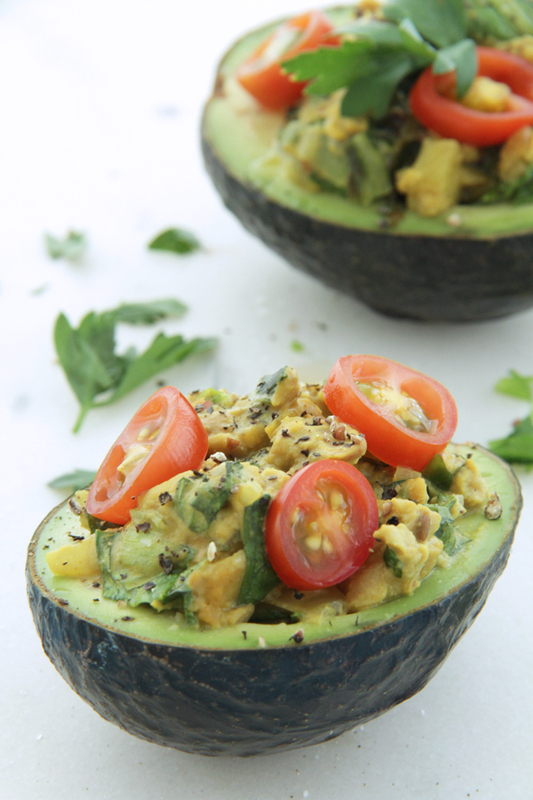 Our next thought was to leave the avocado raw and stuff it with something warm and yummy. Light bulb! 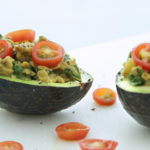 Introducing Cheezy Tempeh Stuffed Avocados. It’s a relatively quick and easy dish to make and it’s really good. Really.You should try it. Avocado helps in keeping eyes healthy and protecting the skin from signs of aging and the harmful effects of UV rays. It assists in maintaining blood sugar levels and has antioxidant properties. It even helps to increase circulation, boost cognitive abilities, and build stronger bones. Avocados are also a good source of monounsaturated fatty acids, they have a low sugar content and furthermore, they are a great source of dietary fiber, a single serving can provide more than 40% of the daily requirement! Tempeh is made from fermented soybean, has a mushroomy flavour and hearty texture. Tempeh provides us with high-quality complete protein as well as all the amino acids we must obtain from our diet. 100 grams of tempeh contains about 18.5 grams of protein, or 37% of the recommended daily intake! It’s definitely well worth trying and especially a great choice for people who have difficulty digesting plant-based high-protein foods like beans and legumes. It is a good source of calcium, manganese, copper, phosphorus, magnesium and vitamin B2. Tempeh is also an excellent source of probiotics which promote health by stimulating the immune system and discouraging the growth of harmful gut-bacteria. Tempeh also contains 100 milligrams of isoflavones per serving, which are phytonutrients with a chemical structure similar to human estrogen. If you have a history of estrogen-receptor positive breast cancer, avoid eating tempeh because it can elevate levels of estrogen and trigger breast cell reproduction.The research on this issue is mixed, but until there is a clear answer it’s best to stay on the safe side. Nutritional yeast is an excellent source of non animal protein, containing all nine essential amino acids (the ones you can obtain only via your diet). Nutritional yeast is also widely regarded as a good source of B vitamins, including vitamin B12, another nutrient typically only found in animal foods. Perhaps best of all, nutritional yeast has a nutty, cheese-like flavor that can be used as a cheese substitute in recipes. 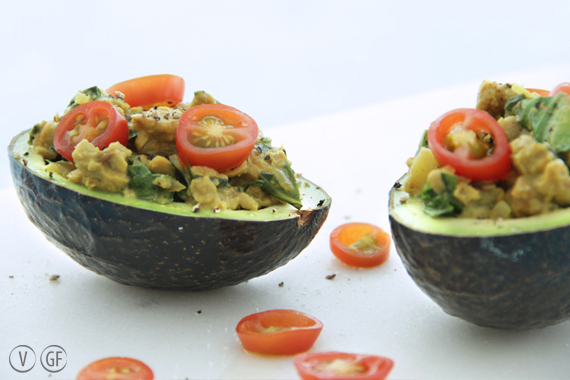 Easy, healthy and filled with complete plant based protein, these stuffed avocados make a tasty side dish or light lunch. Heat up coconut oil in a skillet and sauté the onion together with cumin seeds and turmeric for about 5 minutes. Add bit of water if needed. Mix in crumbled tempeh, chopped collard leafs (stems removed) and continue to cook for another 8-10 min. Turn the heat to low and stir in almond milk and nutritional yeast. Mix well and cook for 1-2 min. 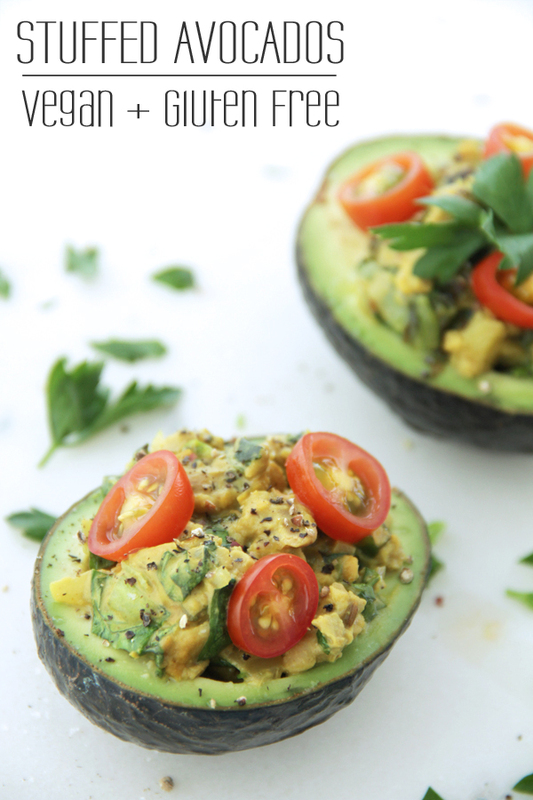 Slice the avocado in half and remove the pit, then top each half with the tempeh stuffing and serve. Makes a great lunch for 2 or a side dish for 4. We hope you enjoy this protein powered recipe!